Right now, more and more residents are reporting raccoons on top of their roofs. The cold weather is forcing many wild animals to desperately search for warm shelter, and this is exactly what all these raccoons doing during these sightings. If you are one of the many home or property owners who have seen raccoons on top of your roof, it is vital that you take action as soon as possible. Continue reading to learn why you need to act fast, as well as, what you need to do! Why are Raccoons on the Roof? As mentioned, raccoons are always in search of two things: food and shelter. If you see raccoons on your property, this is exactly what they are up to. If you see raccoons on your roof, even just one, this is not a good sign. It means they are attempting to access the attic to make their home. 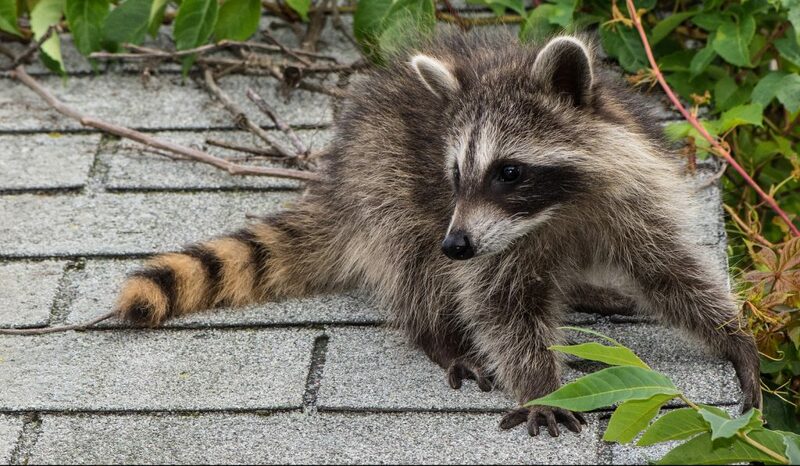 Raccoons can enter though loose or missing roof shingles, rotted siding, crumbling mortar, warped rafters, and more. To make matters worse for us but easier for them, raccoons have dexterous paws that are almost human-like, thus allowing them to easily grip and rip their way into our homes. They can even unlock and open doors if they so choose! As soon as you spot raccoons on your property, whether on the roof, in the attic, or around the yard, your first step is to secure your children and pets. Separate all potential access in order to protect everyone from potential exposure. Once your loved ones are safe and secure, your next step is to assess the situation. If the raccoons are already inside your home, immediately contact a licensed Indianapolis Raccoon Removal and Control Company, even if it is after hours. Reputable and equipped companies offer 24 hour emergency animal removal service. If the raccoons are outside, you can take a more relaxed approach. Begin by determining what it is that is attracting raccoons to your property. Do you have food and water outside? Raccoons love pet and bird food, as well as, gardens and trash cans. Removing these items from your property will help abate raccoon activity, instantly. But this is not all you need to do. If you have raccoons on your roof, you need prompt raccoon control assistance. A professional and licensed raccoon control specialists can inspect your home for vulnerable spots, and seal up any possible entry points for raccoons. From there, they can implement additional strategies to prevent raccoon intrusion and trespassing. 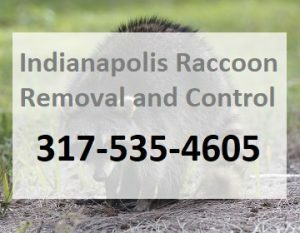 Call 317-535-4605 for Indianapolis raccoon control you can trust. We are DNR licensed and insured nuisance wildlife removal contractors who offer a wide range of raccoon removal and control services, including raccoon cleanup, raccoon proofing, minor restorations for raccoon damages, and more. Call 317-535-4605 to request a free estimate or emergency service, today. This entry was posted in Raccoons and tagged get rid of raccoons Indianapolis, Indianapolis raccoon control, indianapolis raccoon removal, raccoon on roof, raccoons in the attic, raccoons roofs. Bookmark the permalink.